At a White House trade meeting on Tuesday, Treasury Secretary Steven Mnuchin urged President Trump to exempt Canada from steep steel and aluminum tariffs, two senior administration officials and two sources close to the White House told ABC News. 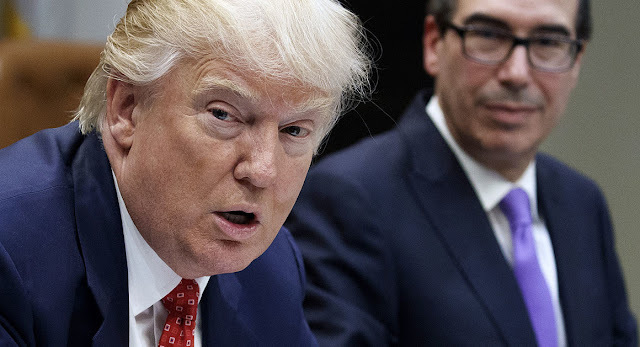 After returning from the G-7 finance ministers summit in Canada, where the G7 (minus the U.S.) blasted new U.S. tariffs, Mnuchin made the case that the U.S. has a $2 billion steel surplus with Canada and a nearly $26 billion services surplus, and should consider making an exemption for Canada. But Mnuchin presented the option to Trump in a meeting of the administration’s most senior economic policymakers, including the pro-free trade, but weak voice, director of the National Economic Council Larry Kudlow, sleepy, tariff-leaning, Commerce Secretary Wilbur Ross, anti-trade advisor Peter Navarro, anti-trade representative Robert Lighthizer and chief of staff John Kelly. But not surprisingly all of the advisers were not in agreement, according to two sources familiar with the conversations, reports ABC News. The meeting adjourned without any clear resolution to the matter. “He’s still deciding on what to do about Canada,” said one senior administration official on the President’s response to the request for leniency.